Setting up a smart home and debating between Zigbee and Z-Wave? We get why you’d wonder—home automation protocols can be mysterious and confusing. But we’ll cut to the chase here: it doesn’t really matter. Sure, there are small differences—Zigbee devices broadcast at a different frequency than Z-Wave devices, and they send data at slightly different rates—but those things aren’t going to make a real difference in your day-to-day. What it really comes down to is product preference. Are you a fan of Philips Hue lights? Those use Zigbee. More interested in the August smart lock? It’s Z-Wave. But honestly, you don’t have to choose between Zigbee and Z-Wave. Philips Hue and August both work with Alexa and Google, so if you’ve got an Amazon Echo device or a Google Home you don’t really have to worry about which protocol your devices use. So what should you get for your home? As smart speaker hubs like the Amazon Echo and Google Home have become more popular, more smart home devices are designed to work with Alexa and Google. In lots of cases that means you can make sure a device works with your favorite smart speaker instead of worrying about whether it is Zigbee or Z-Wave compatible. But if you want to be sure you can connect any Zigbee or Z-Wave device you buy, we recommend getting a smart hub that works with both protocols. Two of your best options are the Samsung SmartThings Hub and the Wink Hub 2. While there aren’t any crucial differences between Zigbee and Z-Wave, we understand that you might want to purchase devices that use the same protocol. Here are a few of our favorite products for each protocol. Most home security systems are compatible with Z-Wave but not Zigbee. If syncing home automation gear with your security system is a priority, we suggest using Z-Wave products in your home. If syncing home automation gear with your security system is a priority, we suggest using Z-Wave products in your home. 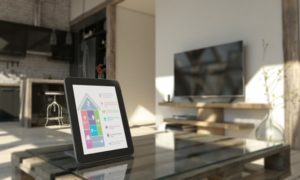 And if you’re a big fan of smart home devices, we recommend looking for a Vivint system since Vivint offers its own high-end home automation devices and works with third-party Z-wave devices. Do you have a preference between Zigbee and Z-Wave? Have you used Zigbee or Z-Wave devices in your home? We’d love to hear about your experiences. Sound off below! See Also: What Is Home Automation?